Have you ever had a "What the heck! Let's do it anyway," moment? Originally, I'm from Manchester and to many Mancunians, North Wales is well known as the place they go for holidays. 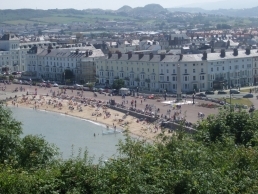 My family always came to Llandudno and as a child, I knew it was where I wanted to live. Mind, up until 18 months ago, I thought we'd be coming here in 2015 or '16 at the earliest. 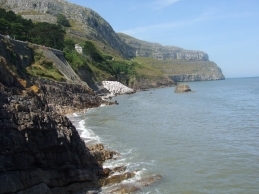 In 2012, when I started looking online at houses for sale in Llandudno, it was more a matter of daydreaming than anything else. But there was one house that I kept looking at. We had singled out three roads as being the best places to live and this house was in one of our chosen roads, a handsome, south-facing 1920s semi with a bay window that was perfect for a Christmas tree. The estate agent had done an excellent job of marketing it - every room had a photo. I loved it, but - isn't there always a but?- it was out of our price range. And anyway, we couldn't possibly pack in our old lives now... could we? That didn't prevent me from returning over and over again to 'my' house, just to see if it was still there. And it was. And I loved it. And we couldn't afford it. Then a friend encouraged me (thank you, Alice!) 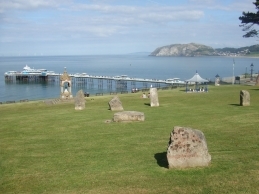 to whizz up to Llandudno to see another property and I was happy to be persuaded. I booked a hotel and made the appointment with the estate agent. My husband knew how much I liked the 1920s house and we decided to look at it even though it was too expensive. I don't know quite what we were thinking. What can I say? I went online to get the estate agent's phone number. The previous evening, the house had been full price. That morning, the price had dropped by a whopping £13,000 - and we could afford it. 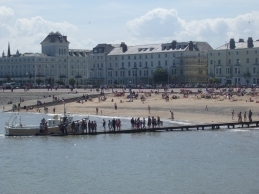 That Sunday, we drove in high spirits from Buckinghamshire up to Llandudno. On the Monday afternoon, we went round the house and made an appointment to view it again the following morning. On Tuesday morning, before our appointment, we stood by the cricket ground at the bottom of Lloyd Street and had our "What the heck," conversation. What about getting jobs here? What about money? But what if we wait until it's an appropriate time to move? Who's to say what will be on the market then? But what about jobs? What about money? And that was our "What the heck? Let's do it anyway," moment. We bought the house. We moved. Everything fell into place. A lot of people have said to me, "It was meant to be," and while I don't believe in fate, I can see what they mean. 18 months on, I can honestly say it's the best decision we ever made.